Getting married is one of life’s biggest steps. It is a commitment to your partner and to building your life together. It’s also a tradition which can help you to feel part of your extended family and your community. In fact, around half of all Australians over the age of 15 years are married. In this podcast, I would like to tell you a little bit about the process of getting married in Australia, and also a little bit about the wonderful wedding of two of my friends who got married recently. In my experience, a wedding is one of the happiest events there is. But it is also very important that is it done according to the law. This is so that there is no doubt that the marriage is valid. In Australia, the laws for marriage are described in a law called The Marriage Act. You can be married by a minister of religion, by a civil celebrant, or by certain staff in the State Registries of Births, Deaths and Marriages. It is interesting to note that Australians nowadays are using civil celebrants more often than ministers of religion. In 2012, for example, 72% of marriages were performed by civil celebrants, while 28% were performed by ministers of religion. The median age at first marriage is 29.7 years for men and 28 years for women. I was 25 and my wife was 24 when we got married in 1977. So what’s involved in getting married in Australia? Well, that can vary quite a lot, depending on the family background of those getting married. Australians from different cultural backgrounds may have different wedding traditions. However, there are some aspects which all Australian weddings must have, by law. First, you must choose a marriage celebrant who will perform your wedding. The celebrant must be officially recognized by the government as a qualified marriage celebrant. You can do an online search of all qualified celebrants in Australia, from which you can choose a celebrant for your marriage. Next, the bride and groom must complete a form called the Notice of Intended Marriage (NOIM). This form must be given to the chosen marriage celebrant at least 1 month before the wedding day. This form makes sure that the celebrant has all the required information, and also provides evidence that you are allowed to get married. For example, if you are under 18 years of age, you can’t get married unless you have special permission from a court. The celebrant also has to be sure of your identity. For example, you must provide a birth certificate to establish your date and place of birth. If this is not possible, you can provide a passport or a statutory declaration. You will also need a driver’s licence, passport or citizen certificate to confirm your identity. Marriages performed by a minister of religion must follow the form used by that religious organization. This includes any special words which must be spoken, including any special steps in the ceremony, as required by that organization. Couples are able to add additional words in order to personalize their wedding vows, but they must at least keep those words in their wedding ceremony. There must also be at least two witnesses to their wedding ceremony. Immediately after the ceremony is finished, the celebrant must take the new husband and wife aside, with their two witnesses, and ask them to sign three marriage certificates. One certificate is kept by the celebrant, one certificate is given to the newly married couple and the third is sent to the State or Territory Register of Births, Deaths and Marriages, which is the government department which keeps official records of all marriages. That covers all the legal requirements. The rest of the wedding really depends on tradition. 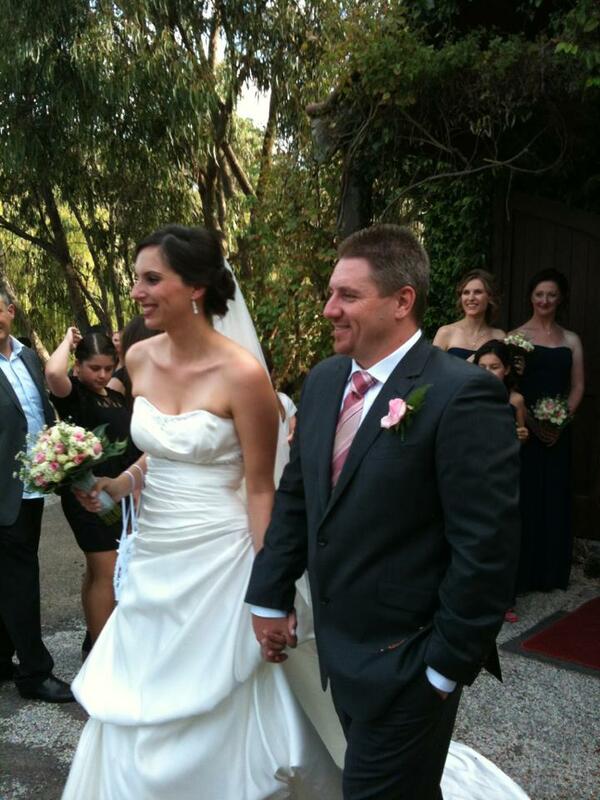 My wife and I recently attended the wedding of our two friends Mark and Felicity. It was a fantastic wedding. It was such a joyful occasion. We were so pleased to be invited. They had a civil celebrant and she was wonderful. She also happened to be Felicity’s mother, which was nice. The wedding was held in a small chapel at a local function centre. The guests arrived first, followed by Mark (the groom), his best man and groomsmen. Everyone took a seat in the chapel and waited for the bride and her bridesmaids to arrive. There was much laughter and smiling by everyone. Finally Felicity (the bride) arrived in the bridal car, dressed in her beautiful white gown. She looked amazing. Her father walked with her down the isle of the chapel to meet up with Mark. I’ve never seen a couple so happy. The celebrant conducted the ceremony, during which Mark and Felicity said their marriage vows and each put on their wedding rings. There were people smiling broadly and there were people crying with joy and happiness. Wow, what a ceremony. I even felt like crying myself. Next Mark and Felicity and their two witnesses went to sign their marriage certificates. The crowd left the chapel and waited for them to come outside. It was great to see them finally come out of the chapel, hand in hand and now husband and wife. The next part of the wedding is called the reception. This is where the newly married couple take all their guests to a nearby restaurant or hall where they can all have a meal, some drinks and celebrate the marriage. Speeches were made by the bride’s father, the groom’s mother, the best man and the groom. People clapped and cheered. The speeches were excellent. Then Mark and Felicity cut their wedding cake. All the guests got a piece. It tasted fantastic. Finally, there was dancing and more dancing. What a way to end the night. Only when the new husband and wife had left the party, did people start to leave. It was a great night and a wonderful way for Mark and Felicity to start married life. If you have a question or a comment to make, please leave it in the comments box at the bottom of this page. Or, you can send me an email at rob@slowenglish.info. I would love to hear from you. Tell me where you live, a little bit about yourself and what you think of my Slow English podcast. I will write back to you, in English of course. Perhaps you could suggest a topic for a future podcast. If you would like to take a short quiz to see if you have understood this podcast, you will also find it on my website. Goodbye until next time. Some of the words of those being married have changed. The changed words are: I call upon the persons here present to witness that I, A.B. (or C.D. ), take thee, C.D. (or A.B. ), to be my lawful wedded wife (or husband, or spouse). Please see the government website https://www.ag.gov.au/FamiliesAndMarriage/Marriage/Pages/marriage-equality.aspx for further details. Podcast 35 Quiz - Did you understand the podcast? You can take the quiz as many times as you like. An individual’s scores are not recorded. True or False? – The laws about marriage in Australia are described in The Marriage Act. True or False? – Today, in Australia, most marriages are performed by ministers of religion. True or False? – Marriages in Australia can vary because of the different cultural background of those getting married. True or False? – The marriage celebrant must be officially recognised by the government as a qualified marriage celebrant. True or False? – The bride and groom must fill in the Notice of Intended Marriage form and give it to the government. True or False? – A birth certificate is the only certificate you can use to establish your identity with the marriage celebrant. True or False? – The minister of religion must use the form of wedding ceremony required by their religious organisation. True or False? – A civil celebrant must use certain words in the wedding ceremony. True or False? – After Mark and Felicity said their marriage vows, they became husband and wife. True or False? – Rob and his wife had a piece of the wedding cake at the reception. groomsmen = the men who help the groom at a wedding. median = the middle number in a range of numbers. For example, 7 is the median of 5, 7 and 9.
valid = when something has been done correctly. No-one can argue that it is wrong. What a wonderful story. You have done the newly weds proud Rob and once again given those learning to speak English a marvelous insight into our ceremonies and way of life. Well done you! Thanks Ray for your kind comments. I enjoyed researching this one. I always thought that the words – I now pronounce you man and wife’ by the celebrant were an essential part of the ceremony. However this is not so. It’s the introductory paragraph from the celebrant, followed by the two vows by the bride and groom, which seal the marriage.